In early 2015, the results of an internal student dining survey indicated a need to change the University of Maryland’s dining program. But rather than simply refresh meal plan offerings, the university decided on a large-scale revamp that, among other improvements, incorporated advanced biometric technology. 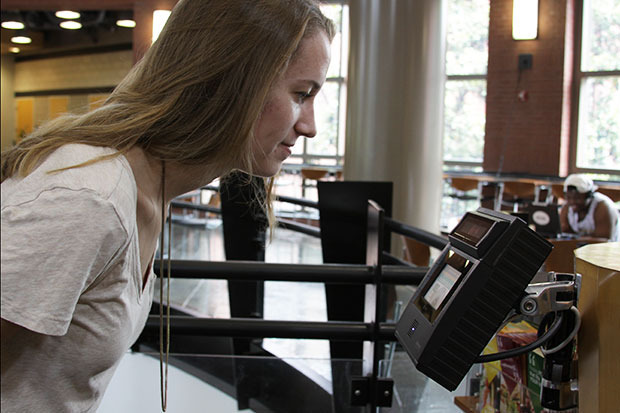 Maryland Dining Services worked with a consultant and card system vendor, CBORD, where initially iris biometrics was suggested for dining hall access. But Ming and his team felt that a solution that leveraged traditional fingerprints would be more broadly accepted. That decision led Ming and Maryland dining to IDEMIA’s MorphoWave product. 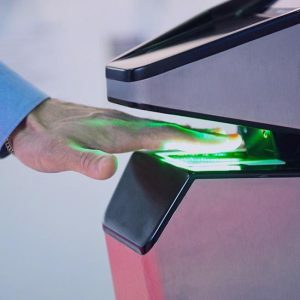 IDEMIA’s MorphoWave reader is a 3D fingerprint technology capable of scanning fingerprints and identifying people with a simple wave of the hand. The reader boasts high speed, touchless fingerprint acquisition. Users simply wave their hand above the device’s touchless sensor in order to be positively identified and gain access. FREE webinar Wednseday, January 30 2:00 – 3:00 p.m. EST hosted by CBORD. Hear more from Wes Urban and Fuller Ming about Maryland’s use of MorphoWave. MorphoWave biometric readers went live at University of Maryland dining halls in August 2016. The university is now entering its third academic year, and sixth full semester with biometric access. “With MorphoWave and the selected dining hall turnstiles, we did all the procurement through CBORD by the middle of the spring semester 2016,” says Ming. Without an established relationship between vendors, troubleshooting can be a challenge. In this way, CBORD’s partnership with IDEMIA is vital. Biometrics has long been a key roadmap item for card system vendor, CBORD, with an increasing number of campus clients now looking to the technology for a wide array of use cases. Urban has also seen biometric solutions being incorporated for attendance tracking and niche applications like elevator control for luxury suites in stadiums. “Biometrics can be used in almost any situation where a standard card reader is used, which makes the technology attractive for any campus looking in the future to go cardless,” he says. During the summer orientation leading up to the system’s full deployment, Maryland enrolled all of its incoming freshman that attended orientation so that when the fall of 2016 arrived, some 90% of the students on a dining plan were already enrolled.